For this edition of the Top 5 Movie Guide, drawing inspiration from this week's "Warm Bodies", we take a gander at some of our favorite Zombie Movies. "Warm Bodies" tells the story of a world already overrun by zombies. But one seems a bit different than the rest. He forms a connection with a human which sets in motion a series of events that could help transform the entire lifeless world. We're not sure how we feel about zombies and humans falling in love, or zombies coming back to life, but it seems an interesting concept for the genre, and one worth exploring. For our lists below, there wasn't much that needed defining. We all know that zombies are creatures that can be portrayed in two fashions: as either reanimated corpses or mindless human beings; regardless, they're almost always cannibalistic. And while zombie films generally fall into the horror genre, some cross over into other genres, such as comedy, science fiction, thriller, or romance. There are great installments from each of those categories, and many are featured below. As a quick bit of history, Victor Halperin's "White Zombie" (1932) is often cited to be the first zombie film. However, arguments have been made that the somnambulism in the German expressionist film "The Cabinet of Dr. Caligari" (1919) was an earlier example, involving a character in a state similar to that exhibited by zombies. But, if you want to get technical, the very earliest Frankenstein and Mummy movies also featured reanimated corpses. Ultimately, it was George A. Romero's "Night of the Living Dead" (1968) that redefined what we today think of a "zombie" (actually, when the film came out, the term "zombie" still wasn't yet around); instead of focusing on enslaved voodoo zombies, Romero was the first to turn them into reanimated, flesh-eating ghouls, which is commonplace for the genre today. This was also the film that really helped kick-start an American fascination with the creatures. Also, before we can dive into the post, we have a quick announcement to make. The fifth contributing member of this post, Andy Schopp, will be taking an undetermined leave of absence from the site. We hope his sabbatical is short-lived and that he remains a part of the site for years to come. The post will be trimmed to four contributors for the foreseeable future, with hopes of adding a new fifth sometime soon. We'll keep you posted on any happenings, but for now, hopefully you enjoy the lists that the other four of us will have to offer! This is one of my favorite horror genres. Typically, zombie movies have something of a slow burn in their progression (traditionally speaking at least - I know modern zombie movies ramp up the action a bit more) and that is very welcoming to me. I love this format and style. Unfortunately, there were still way too many titles that had to be left off this list, but it is what it is. While Romero's "Night of the Living Dead" really started the zombie phenomena, its follow-up was much more powerful to me. Not only did it provide us with the first and greatest what-if scenario for a zombie invasion (trapped inside of a mall), but there is commentary on a variety of topics including consumerism, racism, and war. I don't necessarily need these messages in a film, but I love how seamlessly and effectively they're incorporated into a horror film. Even all of those things aside, we see the first onset of a zombie apocalypse, and some much better characters than were featured in NOTLD. Man, the camp and humor in this film is great! And I love its heavy metal soundtrack. Plenty of great imagery in this one, still some creepy stuff, and the traps these zombies set to fill their need for brains is fantastic - unmatched by other film zombies. This is such a fun movie that makes for a great midnight watch with a group of friends anytime of the year. The third film in Romero's Living Dead series. Again, plenty of really great characters, and I love that we see a world that's been overrun by zombies, with living humans forced to just "deal" with the situation. This one really takes its shots at humanity and political warfare - caging the zombies, harassing and mocking them, doing countless tests on them, etc. You actually feel for these zombies. Otherwise, the gore is ramped up a bit in this film, and there's more camp here than in the previous films, but done to perfection. It's amazing to me to see the first zombie stagger through the graveyard in NOTLD and to finally get to this point, where humans are basically living entirely underground due to the total infestation. A great Aussie feature that's a bit different than most other films on this list. There's some alien stuff in this film too, so it strays a bit, but in the technical sense of the word, it's a zombie movie. The film's effectiveness comes from its over-the-top hero and main character, and plenty of great and unique death scenes. Definitely give this one a watch if you've previously missed it. I could do a Top 20 list on this genre and still hate some of the films I had to leave off. Ultimately, I went with one that really shines in its gore content. There are plenty of great and memorable scenes in this one, and more than enough camp to get you through. I'd love to see a few of the production values upped a bit (this easily bumps up one spot on this list if that were the case), but there's still just too much good stuff here to ignore. For the casual horror fan, this might be tough to sit through, start to finish, but for those who really love the zombie genre, this is a must-see. This is the movie that made me love the horror genre. It's great for having social commentary, but even better for the score by Goblin! This is an indie horror masterpiece. What makes this film so special, besides that fact that it's inspired genius, is that it never takes itself too seriously. Yet, it has one of the most intense/blood soaked scenes ever filmed. One of the select few Lovecraft adaptations that are better than the source. The film perfectly blends suspense and dark comedy, which is made possible by the acting chops of Jefferey Combs and the awesome practical effects. Herbert West is easily my favorite "Mad Scientist". Not really high on the watchability factor, but Fulci knows how to dial in the atmosphere. It also has two of the most unforgettable scenes in the genre - by this point I'm sure you've heard of "that movie" where a zombie fights a shark. Works as both a great comedy and entertaining zombie flick. Talk about amazing opening credits! Zack Snyder is the current Master of this art. I like everything this movie is blending together. It has a lot of humor happening but never tips the scale to make this an actual "zombie comedy". Plus, I like my zombies fast. This might be a perfect film. It's lined with endless rich ideas on social and political issues, some of which are very pertinent even today. Here the humor does tip the scale into comedy. But it is very much welcomed as it is done in a very sophisticated manner. Fast zombies, gritty film stock, top notch acting, and amazing music. Just about everything I need to be on the edge of my seat for a zombie flick. Pulling from early zombie lore, this sequel has the very much dead Bernie transformed into an animated corpse through voodoo practices in this terrible comedy that I can't believe actually exists. One of the worst guilty pleasures in my movie library. I've never considered myself a fan of this genre. I was surprised to see how many zombie films that I actually liked, and it turned out to be really hard to narrow this list down to only five films. For me to enjoy a zombie film, there generally has to be a comedy element involved. I never find zombie films scary (well, there is one exception, but we'll get to that later), so if that comedy element isn't there, then it's usually tough for me to enjoy the film. "Zombieland" has that part down, and it is pretty easily my number one choice. The movie doesn't have a single weakness in my opinion. This movie is entertaining, and the scenario of being trapped in a mall is my favorite scenario to imagine being in if I were to encounter a horde of zombies. The problem with Romero's zombies, for me, is that they're not threatening at all. Don't get me wrong, I still like this and NOTLD just fine, but seriously the only way you should get killed by those zombies is if you're just lazy. They are sooo slow. The budget for this film was extremely low so there are some technical aspects you'll have to get past, but once you do you'll find this is a funny and genuinely creepy movie. I hate those voices they use so much; it's one of my least favorite sounds on the planet. I don't even know how to describe it other than, well, evil, I guess. Okay, so I could have put several other films that are more deserving in this spot, but I left it for this film because at the time I saw it, I was the most scared I've ever been from a movie. I mean, this damn thing scarred me for a long period of time. If you watch the film now, you would think to yourself, what was he so scared of? It was a combination of not really being allowed to watch scary movies when I was younger - so I wasn't desensitized to the genre - and I watched it alone at night...at my grandparents farmhouse...in the middle of nowhere...when I was seven. That combination right there will make any horror movie terrifying! It's the perfect storm. So there we have it, folks. The overall content will be slightly less for the foreseeable future, but between the four of us above, hopefully we can still help provide some great titles of reference! And it goes without saying, the Slackers Shrine will temporarily close its doors, awaiting a fifth member to rise again and bring balance back to the force post. But, onto the films. No film hit on all four lists this week, but in a way, one story did. 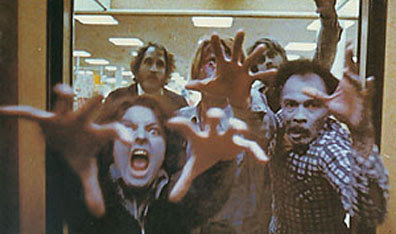 "Dawn of the Dead" (1978) appeared on three of the four lists, the most of any film this week. Interestingly, the 2004 remake appeared on the one list above that didn't feature the 1978 version. The story obviously translated well to all parties, but the preferred telling varied slightly. There's no doubt though that the original version of this film is a classic of the genre, and deserves to be seen. There's plenty to enjoy with the remake as well, so once you've acquainted yourself with the version that half of the writers above chose as their favorite zombie movie ever, go back and check out the remake; see which side of the fence you fall on! Three films landed on two lists this week: "Dead Alive", "Shaun of the Dead", and "28 Days Later...". "Dead Alive" is one of the more outrageous titles you'll find above, coming from the mind of now-famed The Lord of the Rings director, Peter Jackson. The film features some of the most gore you'll see on this list. "Shaun of the Dead" and "28 Days Later..." are much more modern installments to the zombie genre, but definitely two of the best post-2000. "Shaun of the Dead" offers a bit more humor (but in a smart way) to the zombie genre, maybe even being one of the first to make the genre meta and self-aware. A great pick here that deserves to be seen. "28 Days Later..." is from Academy Award winning director Danny Boyle, and offers a great combination of the isolation and grittiness of old school zombie movies mixed with the fast-moving, rage-filled zombies that many modern films showcase. This is a nice artistic piece that also seems a must-see for the genre. Otherwise, just a bunch of solo picks this week. There's so much greatness above that we hope you're able to familiarize yourself with all of the titles this week's post had to offer. And as always, we hope that each of the selections above helps guide you to better and more enjoyable all-around viewing experiences.